An extraordinary journey through the temple, promised to David, fulfilled in Solomon. The place where it was built in ancient times was considered the center of the world. In many ways it has continued to be a center of history. Today it continues as a center of great reverence as well as great conflict. An understanding of the Temple in Jewish life and history is essential not only to understanding the Bible but also history and current events in Jerum today. 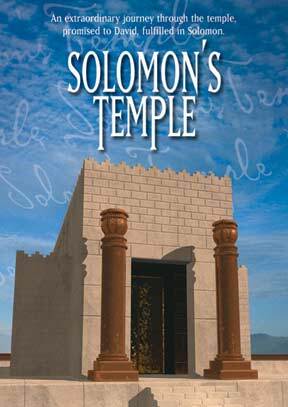 This program gives a basic introduction to the colossal achievement of Solomon's Temple and details its design, construction, meaning for Israel, and what went on there and why. Solomon's Temple was destroyed in 586 B.C., but through the use of modern computer graphics, the Temple is reconstructed visually to provide a contemporary experience of its ritual, beauty and grandeur. Quote from Josh McDowell: "Because of his desire to make his people known, God blessed the kingdom of Solomon above all others throughout the history of the world. At the center of Solomon's kingdom was the temple, which symbolized God's presence among His people and his unique blessing through the nation of Israel. The video Solomon's Temple captures the beauty and grandeur of the temple in a uniquely computer-generated format. It will help to understand the history of Israel as well as shed light on current events in Jerum today."